^ 1.00 1.01 1.02 1.03 1.04 1.05 1.06 1.07 1.08 1.09 1.10 1.11 1.12 1.13 1.14 1.15 Uterine fibroids fact sheet. Office on Women's Health. January 15, 2015 [26 June 2015]. ^ 子宮肌瘤免動刀新療法－海扶刀(HIFU). 高醫院訊. 鄭丞傑. 2015-08 [2016-02-06]. ^ Global Burden of Disease Study 2013, Collaborators. Global, regional, and national incidence, prevalence, and years lived with disability for 301 acute and chronic diseases and injuries in 188 countries, 1990-2013: a systematic analysis for the Global Burden of Disease Study 2013.. Lancet (London, England). 5 June 2015. PMID 26063472. ^ Wallach EE, Vlahos NF. 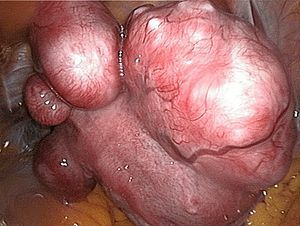 Uterine myomas: an overview of development, clinical features, and management. Obstet Gynecol. August 2004, 104 (2): 393–406. PMID 15292018. doi:10.1097/01.AOG.0000136079.62513.39.